If you are in Ibiza then you may be a tourist soaking up the sun and music which Ibiza has to offer. The British Consulate in Ibiza can assist you with consular assistance if you have been involved in an accident or have been arrested. You can ask for assistance with regard to applying for a passport or renewing your passport while in Ibiza Spain. Ibizia is very popular with all British nationals however from the stats on accidents and crime abroad we also know that this comes at a price. See the report on British Nationals Abroad for more information about Ibiza and other popular tourist destinations across the world. If you cannot obtain assistance in Ibiza then you can also contact the British Embassy in Madrid for more information which has also been listed on this website. 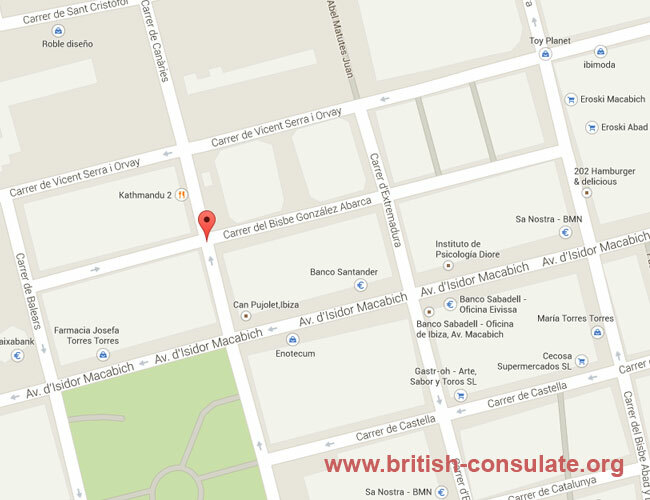 We have added a map to the Consulate as well as their contact details such as their telephone numbers and street address below.